Good morning neighbors! Have you heard of the City of Lansing’s Wet Weather Control Project? Did you know that if you live in the mid to western half of the neighborhood it may affect how you go about your day to day as early as this spring? 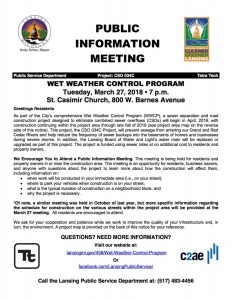 Attend the public information meeting tomorrow starting at 7:00 pm at St. Casimir Church. Find out more at https://www.lansingmi.gov/4…/Combined-Sewer-Overflow-Project.